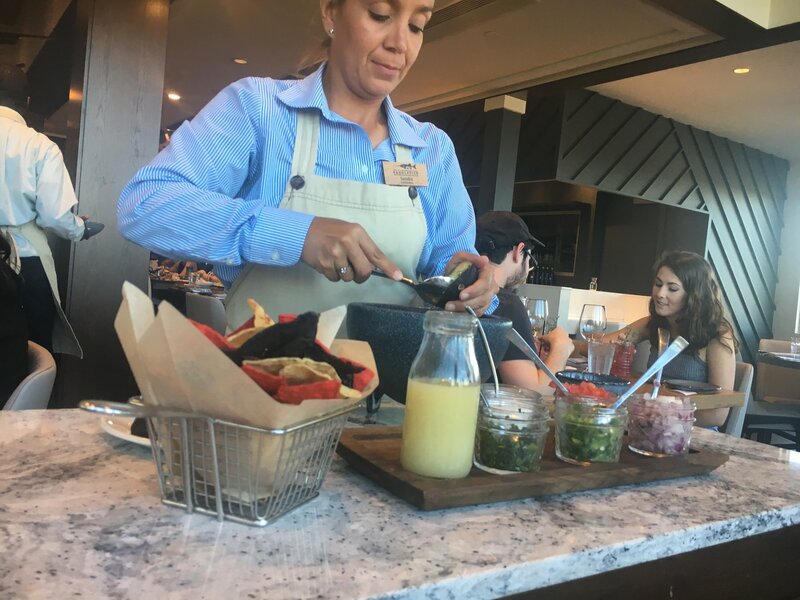 Our recent trip to Walt Disney World brought us to a new restaurant at Disney Springs – Paddlefish! Though the name of the restaurant is new, the location itself is not and comes with some interesting history. Located on Lake Buena Vista, it opened in 1977 as the Empress Lilly, named after Walt Disney’s wife Lillian. After closing in 1995, it was opened again in 1996 as Fulton’s Crabhouse. At that time the paddlewheel and smokestack were removed. Fulton’s Crabhouse operated until 2016 and then after a complete renovation, Paddlefish opened in 2017. Its grand opening revealed a re-imagined interior including a contemporary, sleek and up to date look that fits right in with the new Disney Springs. 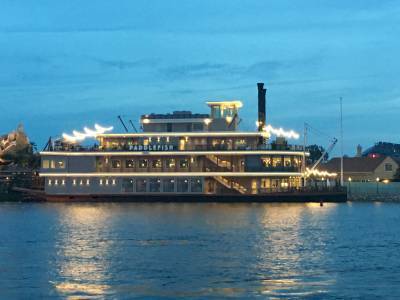 The paddlewheel and smokestack were also replaced at this time to enhance this beautiful new restaurant. 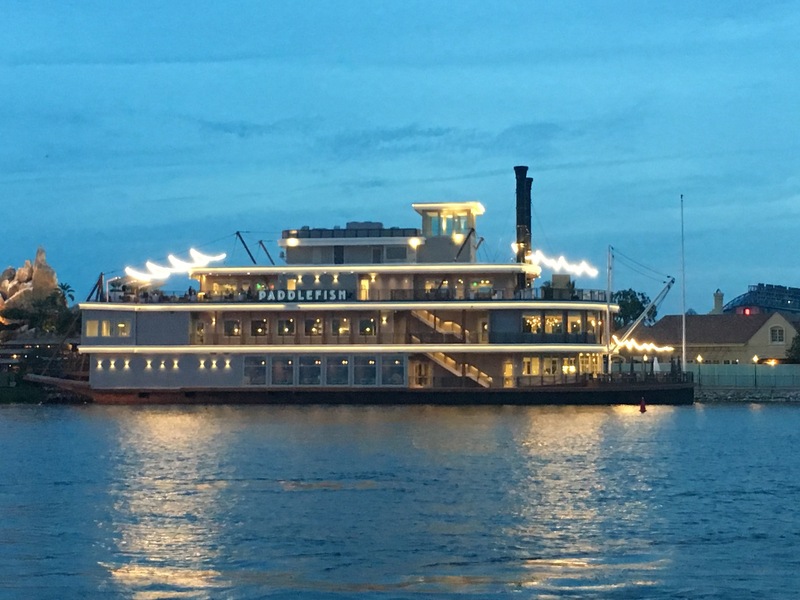 Once I arrived at Disney Springs and saw the paddleboat I was extremely excited for our evening at Paddlefish. View of Paddlefish restaurant from dock. Paddlefish has a very upscale feel. It has 3 floors with different decors for dining, several bar areas plus a rooftop bar. The restaurant has a very open feel and the views of Disney Springs are amazing! Our reservation time was 7:00 pm and shortly after we arrived we were seated on the 2nd floor. Our server brought us a bread service with cinnamon honey butter which was delicious! Our family is a mixture of adventurous and not-so-adventurous eaters so a good menu variety is important. While seafood is the highlight at Paddlefish, the array of offerings on the menu would satisfy just about anyone, even if you did not care for seafood. Steak, chicken and pork menu items were also available. We had previewed the menu prior to arriving and were very interested in the Tableside Lobster Guacamole as an appetizer. It was absolutely fantastic! A chef came to our table with a cart of all the fresh ingredients to prepare the guacamole. Lemon juice, jalapeno peppers, tomatoes, onions, cilantro, avocado, spices and of fresh course main lobster! I have to admit it came with a hefty $34 price tag just for this dish alone but it was worth every penny. The Seafood Boil is a unique menu item that Paddlefish offers. They have specialty boils for you to choose or you can build your own from a variety of seafood such as king or queen crab, clams and mussels, gulf shrimp. No one in our party chose to order the boil but someone next to us did and it looked delicious. Our party ordered three different entrees. I ordered the Snow Crab Legs with corn on the cob and new potatoes. My husband and daughter both ordered the Sea Bass with coconut milk, crab broth, tomato, peppers and ginger. My son had the Macadamia Nut Crusted Hawaiian Opah with red curry and fried rice. While the crab legs were good, they were not anything special (other than the fact that they WERE crab legs!) and next time I would chose try something different. My husband and daughter said the Sea Bass was fantastic! My husband was thrilled that the crab broth that accompanied his sea bass also included quite a few mussels! My less adventurous daughter did not care for the mussels. The menu did not indicate the mussels would be part of the meal and she would have made a different selection had she known. My son was delighted with the Hawaiian Opah. Overall I would give the Paddlefish four out of five stars. I thought the food was fabulous and we all agreed that we would return again someday because there were many other menu items we were interested in trying. The Fish and Chips, Shrimp and Grits, and Black Cod en Papillote looked intriguing as well. I wasn’t overly impressed with the service however. Our server was pleasant but not very efficient for a restaurant in this price range. Our table did not get cleared as dishes were finished. Drinks were only replenished upon asking or in one instance forgotten about completely. There was also an issue with the bill and charging our meal to our room account with a magic band. It was finally resolved but took a very long time. Paddlefish is definitely a higher end restaurant and the prices reflect that. Our bill for the lobster guacamole, four entrees, two sodas and one beer was $231 plus tip. If you are considering using Disney Dining Plan credits, it is a Signature restaurant and therefore takes two table service credits per person. Our family used the dining plan this trip but paid for Paddlefish out of pocket. We really wanted to try it but decided our credits would have better value elsewhere. I really felt that the quality of the food was worth the price. The next time you are in the Disney Springs area I would highly recommend a stop at Paddlefish. My favorite of the evening was definitely the Tableside Lobster Guacamole with the tri-colored chips. The ambiance and décor were refreshing and the view of Disney Springs was fantastic. I hope you get a chance to visit! About the Author: Molly is a Disney fan and an Independent Travel Planner specializing in Disney vacations. She lives in Nashville ,Tennessee and is always looking forward to her next magical adventure. You can find her online at http://agents.travelleaders.com/mollyjuba.